In January, the Massachusetts Supreme Judicial Court was tasked with answering the question of how the rising number of independent contractors are to be treated when it comes to workers’ compensation. The case of Ives Camargo v. Publishers Circulation Fulfillment had been found in a lower court generally in favor of the company, but an appeal was requested by both parties over details in how the ruling impacted them. According to Jobs for the Future, a nonprofit operating in favor of working people at high risk of exploitation, the number of independent contractors in the United States has been increasing nearly every year since the late 1990s. Aside from one dip in employment that affected both employees and contractors in 2010, the number of contractors has continued to rise even when the number of employees was falling or remaining stagnant. There are benefits to this shift of employment status. For contractors, this arrangement offers greater freedom in how, when, and where their work is performed. For employers, independent contractors provide needed or peripheral services with little obligation placed on the company. That benefit to companies is also reflected in one of the major drawbacks to contractors: Companies are not held to the same standards in their treatment of contractors as they are when dealing with employees. This means, for instance, that employers are not under obligation to cover workers’ compensation benefits for independent contractors. 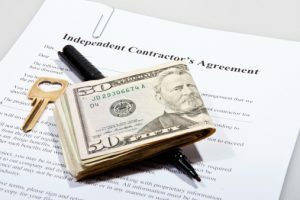 What rights do independent contractors have? Jobs for the Future argues for greater protections of independent contractors. They note a struggle in various cities to expand the rights of contractors, including a law in Seattle that is under a lawsuit and has been at least temporarily suspended by the courts. The Massachusetts court, in Camargo v. PCF, ended up ruling that Camargo should be considered an independent contractor and therefore is not entitled to compensation for the injuries she received while performing her duties to the company. While they cited other cases with similar employer/worker arrangements, this case establishes precedent for the specific matter of workers’ compensation, and it is a dangerous one to set. Those who carry out the work of these companies deserve the basic protections that workers in America enjoy and should be able to hold their employers accountable for dangers that arise as part of their duties. We fight for workers who must battle their employers for their rights and protections. If you have a workers’ compensation claim, do not hesitate to call us and find out how we can help you. This entry was posted on Wednesday, February 28th, 2018 at 9:31 pm and is filed under workers' compensation. You can follow any responses to this entry through the RSS 2.0 feed. Responses are currently closed, but you can trackback from your own site.